WOMAN (big smile, enthusiastically): HEY there! WOMAN: I'm ______'s mom, are you helping out too?? JEN: Oh! yes. Wait, do i know you? JEN: Oh! So you're just really friendly! I thought you knew me and i was like, 'heyyy...buddy!'" WOMAN: (joke does not register. Continues:) So, whose mom are you? JEN, laughing internally: Julian, right there. WOMAN: Oh, fun! What's your name? My name's _______. JEN: My name's Jennifer. Good to meet you, ________. And it was awesome because it was pret-ty awkward and, as we all know, moments like those are my bread and butter. But I sat there thinking, ok i know I can come off kind of reserved or... what, unenthused? Not like, NOT excited. Just.. you know, neutral. Chill. Just sitting there waiting for writers workshop. And she really approached me-BIG smile, as if she knew me. So it's not totally my fault. My awkwardness is not totally my fault, I tell you! Also people here are really, really friendly. And then the day ended and I woke up the Friday morning dreaming the weirdest dream ever. My alarm went off and against all the odds of the morning, if we hurried, Julian and I would have time to walk to school. It's a-mazing how long it takes that kid to get his shoes on. And that's the only cliche mom thing i'll say in this post. BUT FOR REAL. Anyway, the sky was cloudy, the sun just peeking over the mountain giving the morning a pink tint and it's my favorite time of day. The air was warm, the leaves were swirling in the wind blowing alongside us like a buddy and it was a glorious, glorious morning. I decided to mow the lawn afterward which is always a good choice because something funny, magical, or interesting always happens when I do. The last time I mowed I pushed the open trash can and, because it needs to pivot on the wheels, the lid was too low and yup, i slipped and tripped on it, knocking both of us down, and i got cut grass in the face. It was THUH best. This time, since we have a tree planted sort of in the corner quadrant of our corner house, i had made a vow to mow in concentric circles around it, which i did, and which was kind of hard. I asked my neighbor to look out her upstairs window to tell me if it looks cool but she hasn't gotten back to me. I wonder if she thinks I'm joking. But anyway, while mowing, I saw a big green bug on the side of the house. What is that? i thought. And after a few more passes I realized it was a katydid! Fun! Yay! Leaf bugs! I never see them. Thinking they are special and rare, I ran in the house and grabbed a jar with which to capture it and show to Julian later. 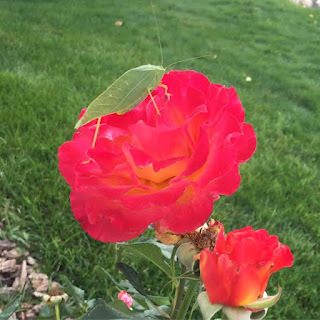 I easily knocked the katydid into my jar and, feeling pleased, rounded the corner of the house when I spotted a tall pretty rose on the bush and there, sitting atop, staring me down, was another katydid. ! I gave a yelp, highly unsettled. I felt a little uneasy because, having just caught one, I thought it was weird that another would immediately appear, perhaps to guilt me? I was also a little scared that if I turned around I'd see dozens of katydids all sitting there, quietly looking at me. It's Halloween-time and I get all hitchcocky, you know. And thus concluded a successful Thursday to Friday transition.